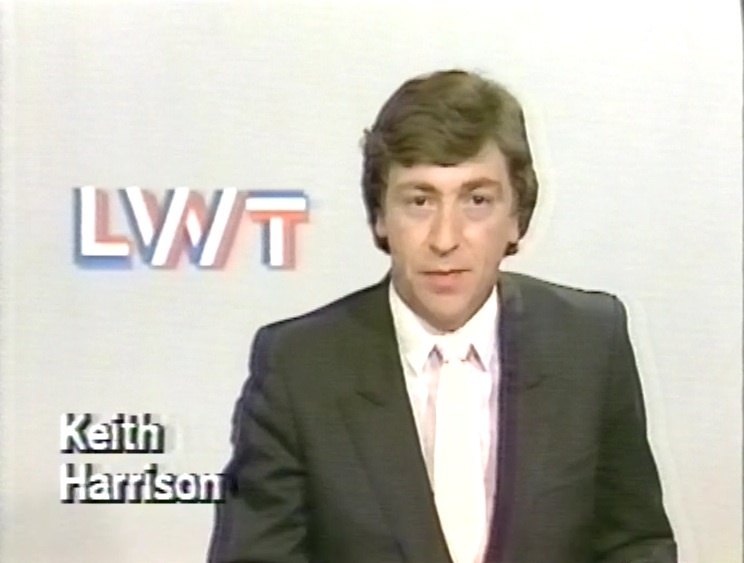 Before the main feature, Keith Harrison reads the LWT news headlines. Bit of a cheap in-vision presenter, here, not up to ITV’s usual standard. Then, an ITV Movie Premiere, with Stephen King’s Children of the Corn. This is a movie which nobody really expected much from – a low budget horror based on one of King’s short stories, it could have been another Cat’s Eyes, but this movie has, rather amazingly, spawned eight further movies, although having seen none of them, I can’t comment on their quality. This one, though, is an effective horror movie, which I’ve always thought benefits from being based on a short story. Novels are often much too long and complex for a single movie, but a good short story can provide just enough material for a very effective movie, and at 90 minutes, this is about the right length for a horror movie. I don’t think I’ve watched this since the 80s, so I wonder if it holds up at all. The opening is quite shocking, as the children in the town of Gatlin all suddenly turn on the adults and kill them all, led by the enigmatic young preacher, Isaac. What makes the opening work is that the film starts with a really bubbly voiceover from one of the children, the only one who did not take part in the massacre, so when the kids suddenly start poisoning, stabbing, slashing and cleaving the adults, it’s an abrupt tonal shift that really works. Cut to three years later, and Linda Hamilton (Sarah Connor herself) and Peter Horton (off of thirtysomething) are celebrating his birthday in a motel. They’re driving to his new job, which takes them close to Gatlin. At the same time, one of the children, who isn’t under Isaac’s spell, tries to leave the town, but Isaac’s henchman Malachai, played by the unmistakable Courtney Gains in his first film role, kills the boy, then leaves his body propped up in the middle of the road, so that Horton and Hamilton, distracted momentarily in that way people often are in films, hit him. This is such a common scene in films, and so often makes little sense. They’ve been driving down these straight, flat roads, and yet a tiny distraction means they hit an obstruction. They’d see it on the road a mile away. Anyway, despite being warned away from Gatlin by the only grown-up in the area, the obligatory old man who gives portents of doom, their car seems drawn to the place. Isaac tells the children that it’s all part of a prophecy from He Who Walks Behind the Rows, the strange pagan god they worship. This middle section is less successful, as the tension from the start dissipates, and they spend a lot of time wandering around the deserted town. My recording is not helped by the temporary loss of sound during this section. ITV can’t even get the apology for loos of sound right, either, as two different voices pipe up to apologise. Eventually, Malachi decides that Isaac isn’t doing a crazy enough job as their leader, so he tries to sacrifice him, but this backfires when Isaac comes back from the dead. Then the evil spirit that lives in the cornfield starts manifesting as some dodgy looking electronic effects, and Peter Horton has to work with the cute kid from the opening to burn down the cornfield and destroy it. Ultimately, I think this film is a little too stretched – I still think short stories can be good film sources, but they needed a little less padding in this one. 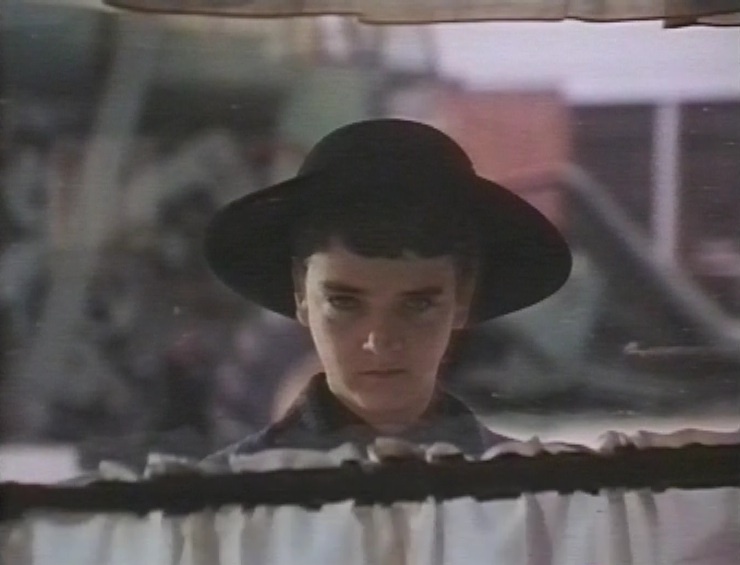 But John Franklin as Isaac was excellent – and iMDb says that he went on to appear in Beauty and the Beast as ‘Young Vincent’ – another Linda Hamilton connection. There’s another tape glitch during the credits, but it’s hard to tell if that’s on broadcast or just on my recording. Then, it’s Episode 3 of Brond, which I have recorded elsewhere. I’m not sure why I have two copies of this, but there we are. After this, there’s a short programme in the series Election Briefs. Luckily, we have Michael Ignatieff to help us pick through the tricky issue of what makes a woman. At least the rest of his panel is made up of women psychoanalysts, and he’s merely the moderator. From what I hear, Charlize Theron would be very happy if you never saw any of the sequels (ditto Eva Mendes and Naomi Watts). 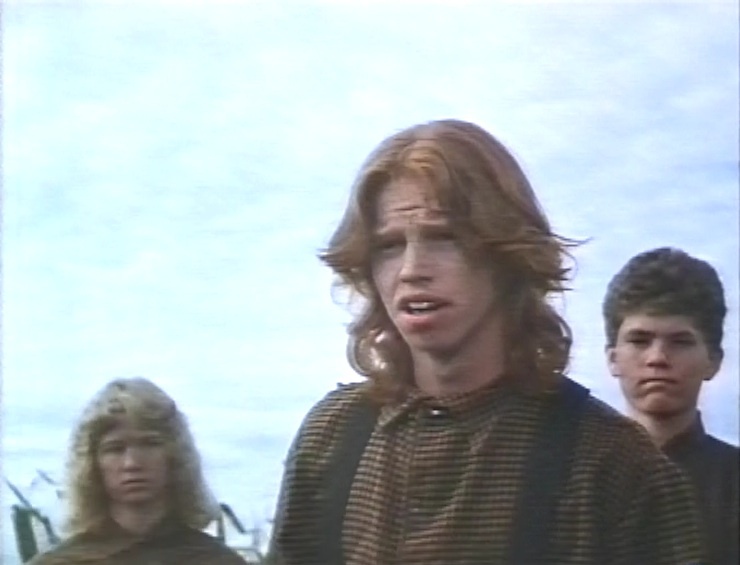 I wonder how often Courtney Gains has “MALACHAI!! !” shouted at him a day? I have a soft spot for this, I remember staying up to watch it while staying with my grandparents and being quite impressed. John Franklin makes the movie, he’s great in it. If I recall, the King story doesn’t have quite the happy ending the film does. I think you’re right – Franklin is the standout, and Gains plays creepy psycho so well I’d be nervous meeting him, but the film is just too stretched to be a classic. Hi! As per Gordon’s message above – I’d really like to get a copy of this if it’s at all possible. I was 11 at the time of the screening, and it scared the hell out of me! Every version I’ve seen since has been cut, and it’s been nagging me for years! Please email me if this can be done! Phil, also put a comment on the Project page whick you enter through the menu button above and where you will see my further comments and a reply from vhistory. He feels uncomfortable posting the whole thing on youtube due to copyright etc, so I have requested he at least put up the cut scenes and of which I have listed the majority. The more that comment will hopefully get these up. Hi Gordon – I’ve watched the broadcast through just now, and the scenes aren’t present! Unless we’ve both succumbed to mass hysteria or the screening was from a later date – I’m a little bit stumped! Yea, complete disappointment, like I first thought(before I was made of aware of the Movie Premiere 87 showing) it must of been the second showing on ITV around the time of the short Stephen King Movie Season in Nov / Dec 89 when ITV also accidently showed the Movie Premiere of the US Theatrical (extended) version of The Shining (09/12/89) and hilarious US edited for language tv version of Christine. So am on the lookout for that one. Still nice to have this version as nostalgia which includes the ITV Movie Premiere bumper. Have to get a The Times trial subscription and search through the TV listings to get an exact date of the second showing. I am definitely not dreaming this version was shown as I clearly remember the extended diner murders scene along with the killing of the sheriff (otherwise known as the Blue Man scene). I had the recording for a few years before stupidly taping over it thinking it was just a readily available US uncut version. There is a guy on another forum who clearly remembers it as well and thinks he still has the recording in his attic after noticing these extended scenes but has not responded yet to my pm’s. Also there was another guy who was advertising in the Dark Side magazine for years requesting a copy after seeing the showing. At the time of its UK video release in 84 Thorn EMI were given numerous versions of this film including the Director’s Cut (insider knowledge from an employee) to decide which to release but due to the Video Nasties furore at the time ultimately went with the regular theatrical version. I’m so sorry, guys. After all your anticipation, too. Part of the reason I’m doing this blog is just in case there’s something on my tapes that’s genuinely rare, so it’s sad to hear that this isn’t what you hoped. Ah no problem Jim! Thanks for letting us see it. Looking forward to the rest of your blog. No need to say sorry, you were the one doing us a favour which I can’t thank you enough for, just a real shame it happens to be the showing after this. After first thinking it was the second showing around the time of ITV Stephen King Mini Season in 89( may not of been part of it, but it was around this time), learning of the first showing threw me a curve ball and now seeing confirms it (thought it might be a ITV region only version as well but you recorded the London region one like me so definitely must of been second showing), even though I did see this showing at the time. Loved seeing the ITV Movie Premier bumper though, worth keeping for that alone and the of course the apologies sound interruption. Now my quest begins in searching for the second showing once I can get the date confirmed. (Need to get into The Times listings but don’t fancy paying a trial subscription for that alone). The BFI website used to list all the relevant showings of a particular film including this one but alas no more. Shame ITV dont have a similar website to the BBC’s Genome. Keeping a lookout for anything else you may post which has an interest for me. scottish papers archive with tv listing, great for finding dates. I Couldn’t find Children of the Corn in Nov or Dec 89. The Shining premiere was on the 6/12/89. The BFI site used to list all the showings including the second one in 89. It wasn’t part of the short Stephen King season which included The Shining, Christine and I believe Cat’s Eyes. It was slightly before that. I really thought it was the movie premiere in 87 (live in London region as well, same as the this recording) which was the Director’s Cut but your mind can play tricks on you with dates. I still wish I never got rid of my recording of it but stupid me assumed it was just the uncut US version, it was only a few years later after I obtained the US tape that I realised what a huge mistake that was. The diner scene was so much longer with numerous other killings including a very graphic throat slitting and all the other scenes mentioned over at imdb alternate section. Maybe, one day it will see the light of day but not counting my chickens, as both Anchor Bay and 88 Films had little luck in obtaining it from the movie studio. BFI used to list all the tv showings including the one in 89. It was shown a little before the short Stephen King Season which included The Shining, Christine and I believe Cat’s Eyes. It may not of been on in the Scottish region but was definitely on in the London region. The 9 May 1987 broadcast was 100 mins long including adverts and beginning with LWT News (10:45pm – 12:25am). There was another broadcast on LWT 23 August 1988, 11:35pm – 1:10am, which appears to be 5 mins shorter but isn’t preceded by a news bulletin. There were two regional broadcasts in 1989: TSW, 19 May, 11:20pm – 1am, ie 100 mins; TVS, 28 November, 11:45pm – 1:30am, ie 105 mins. Then 16 Feb 1990, HTV, 2-3:40am, ie 100 mins. Then 3 Sept 1991, TSW again, 11:40pm – 1:25am, ie 105 mins. Then 10 Oct 1992, Scottish. No time listed for this. I also recorded the film in 1987 but it’s sadly long gone. I was a young boy at the time and my parents sent my out of the room during the initial massacre. The only thing that sticks in my head is the guys have being forced into the meat slicer. Thanks James, as it definitely wasn’t the first showing (I really assumed it was), it would of been the 23rd Aug 88 showing (assumed it was in 89). That is now the holy grail recording which needs to be found. Why, oh why did I have to tape over it is beyond me. Someone over at snother forum I frequent said they had a copy of this Director’s Cut showing in their attic and would have to look for it but since then he hasn’t replied. Hi, could you give me a link to this archive. I meant a link to the Daily Mail online archive that James mentioned above, but I obviously didn’t make that clear. You should see the Daily Mail archive in the resource list. Click on it, then click ‘Log-in though your home institution’ on the Gale website. It’s not as easy to use as BBC Genome. Search for titles in the search box, then filter by article type and choose ‘entertainment’. It’ll bring up a lot of satellite channels search results but you’ll soon learn what to look for to identify terrestrial tv. Thanks very much for the access to the Daily Mail archive. Now that I remember, I’m sure it was the second showing of COTC which was the Director’s Cut as I remember the Thames bumper before the film rather than LWT. Loving the archive, reading old news about the video rental boom and nasties period along with all the old tv listings. Thanks for doing that. This is exactly what I needed as it has been a real nightmare trying to figure out the date for some of my tapes. You’re welcome guys. I’ve found the archive invaluable for putting dates to my childhood/adolescent memories of watching films and programmes. I don’t suppose you guys know where i might be able to get hold of the 8 part Greece Uncovered series do you? It was made by LWT for Sky in 1998 and has been shown numerous times on Sky channels and on Channel 4 in 2000. There’s a couple of partial clips on Youtube but most have been removed. There’s also a 70 min compilation on VHS but the full series had never been released. Any suggestions would be greatly welcomed as i spent the summer in Corfu that year and would love to see all the old faces and bars again. Had a look around some of forums I frequent in regards to the Greece program you mention but can’t seem to find anything or anyone who has it outside of the clips you mention. After helping me with COTC so wanted to find it for you but unfortunately no lock. No problem Gordon. Many thanks for trying. ITV will digitalise individual episodes but at £120 a pop it’s a bit out of my budget to buy all 8 (plus they won’t sell complete series for non-commercial use). Very frustrating when broadcasters take down material from Youtube despite it having virtually no commercial value any more. Also as far as I am aware itv would not sell archive film showings due to copyright belonging to the film studio and also I believe they send back the master tapes they use to the film studio once they have had there allowed run (it was the LWT / Thames region I recorded it from but assume it was on in other regions as well). Hi Gordon – ah, I didn’t know that about sending the master tapes back. This is going to be a tricky one as it’s nearly 30 years ago on a format many people threw out once DVDs came in. What’s interesting is the running time. The 23 August 1988 showing is only 95 mins including all commercial breaks. As the current release is 93 mins, this doesn’t allow much time for extra scenes. The TVS showing on 28 November 1989 is 105 mins, which allows quite a bit of extra time. Could this have been the version you saw (as TVS covered the South East of England, bordering LWT / Thames)? No, it definitely was LWT (Thames during the week), Couldn’t pick up any other ITV regions clearly outside of very poor dotty blk/wht picture. The run time of 93 mins is at 24fps (23.976), at 25fps (Pal) it would of been shorter along wih either shortened or speeded up credits. The deleted scenes weren’t very long, at most two mins maybe. IMDB lists the film as 92 mins (@23.976 fps) when you convert that to PAL (@25 fps) you get 88mins 19secs. Then lets say you add 3x4min commercial breaks then total would be 100mins 19secs. The only progress that has been made is that we need to locate the second showing of the movie which was shown on Thames TV (other regions maybe as well on 23rd August 1988 which is the director’s cut, it definitely is not the movie premiere showing on the tape above. If you don’t mind me asking which regions bluray are you working on. Maybe as you work for a movie supplier you would have better luck than us with contacting ITV and confirming who supplied that showing and whether they still have it within their archives (I doubt it). Many thanks for the info. I’m working on the Region A release, but please keep that between ourselves for now 🙂 I’ve tried my contact at ITV, but predictably they said that the tape would most likely have been returned to the licensor decades ago. According to the BBFC website, the film was owned by Warner in the UK at the time of the broadcast so that might be a potential lead… The ideal scenario of course would be that the missing footage turns up when we come to scanning the film material for our new restoration… not sure how likely that is though! Thank you for letting me know re the region A release, will keep to myself and obviously all that read this blog. So looking forward to the new restoration (have a feeling I may know which company you are working on the release for). The existing master while ok (both Region A Anchor Bay and Region B 88 Films, both who failed despite trying to locate the footage, although I don’t think thry tried very hard) could do with a nice overhaul either at 2K or higher (I assume you are working with at least an IP or ideally the OCN). As said the broadcast tape you would be needing to locate for the Director’s Cut is the second showing on Thames TV (ITV London) from 28 August 1988 which was shown at 22:30. Your contact at ITV may now someone in the movie dept who would have access to the broadcast masters log from thst time, it would list who supplied the master tape and ultimately was returned to. It is the only known showing of this version. Also there was someone who worked at Thorn EMI video in the 80’s who confirmed they received numerous versions of this film including the Director’s Cut to review and decide which version to release (due to the video nasties scare at the time they Ultimately chose to stick with the Theatrical release). I tried to contact the Director of the film through numerous websites he runs (he is also a university lecturer) asking if he knew of source for this version but despite my efforts never received a reply. It would make my day if you could go through the vaults at Warner and find this elusive version. Please keep me updated on your progress, I would be most grateful. Could this be the uncut version? It says uncensored. It seems strange that only two people remember this broadcast. I also saw it on TV in the 80s and at the cinema – and it was exactly the same version that I’ve seen on every subsequent release since. I would love to see the additional cuts that you speak about. Good luck with obtaining a copy of the film. Do not bother bidding in this item, it is not the Director’s Cut just the normal R rated print. Believe it is from the Netherlands where the original cinema release was cut further than the r rated print, and this is the reason it says uncut as it is the r rated print without further cuts. The Director’s Cut has never been released officially to the public anywhere, period. Only time it has been seen is the second showing on ITV (Thames and maybe other regions) and an employee from the original Thorn EMI video label suggests they were offered three versions of the film including the Director’s Cut (other versions been r rated and an even more cut version). I sent an email to Jonathan Elias, the film’s composer, who would definitely know if the film was originally longer. Interestingly enough the film soundtrack release does not include the Hanson’s coffee shop massacre music, but if we had that it would prove that it the scene indeed was originally longer. It was obviously left off the CD and LP release for a reason. This seems very odd for someone who would have clearly scored the whole film and claims to not remember a thing about it. It’s almost as though these people don’t want anyone to know anything about it so they deny its existence. All very strange. Sadly, the version I have is the theatrical version, as confirmed by others searching for this possibly mythical extended version. Perhaps it really doesn’t exist, and all the rumours are just that. At least he replied, unlike the director who I contacted numerous times (he’s a also a film lecturer) around the time of the 88 Films release to ask if he has any leads to a print of the Director’s Cut. At the end of the day, I would cut him some slack, he was simply the composer and unlike someone directly involved in it’s making, he most probably only saw dailies / workprint versions of the scenes he needed to score and would of been more interested in the musical aspect rather than sitting there and enjoying the film as a whole. And, we are talking 34 years ago. I already know for definite this version existed as I recorded it at the time of it’s broadcast (second showing, weekday showing on Thames TV) and then a few years later stupidly taped over it (really needed the tape at the time to record something else) thinking it was just the uncut US version, bad move on my part. This premiere showing on LWT through me a curve ball thinking it was the ITV premiere version, but in the back of my head always thought I recorded it during the week rather than at rhe weekend. As said previously a Thorn EMI employee (at the time of it’s VHS release) has also confirmed this version existed as they were given numetous version’s of it to review for potential release (including this version) but ultimately went with the theatrical due to the furore at the time regading video nasties.